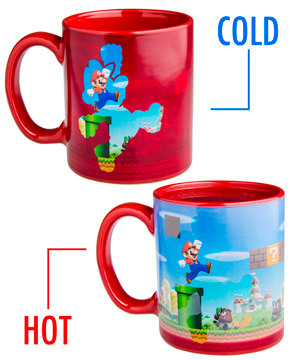 Whether you’re starting your morning with a caffeine power-up or pressing pause on your afternoon with a mid-day tea break, enjoy your beverage from the Mario Heat Change Mug. Add any hot liquid to the mug to reveal a picture from the Mushroom Kingdom, a land of color, wonder, and an unusually high incidence of royal kidnapping. The scene depicts a high-resolution incarnation of Mario and his enemies as 3D renderings in a lush, colorful environment. Enjoy a drink from the officially licensed ceramic mug and you’ll feel like you’ve jumped to the top of the flagpole. You’re not gonna believe it, but the Princess needs rescuing again. 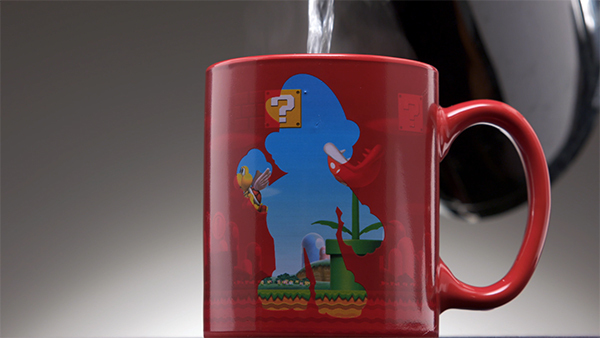 But before you catch the next warp pipe to work, take time for a cup of joe from the Super Mario Heat Change Mug. 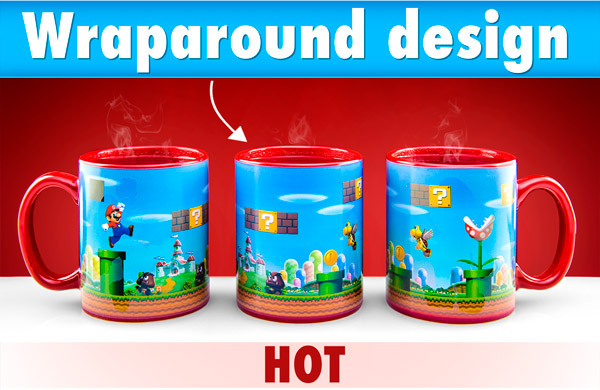 When sitting at room temperature, this mug is solid red with dual Mario silhouettes offering a peek at the multi-colored world beneath the glaze. Add a fireball-hot liquid to the mug, and the red facade fades to reveal the magic and majesty of Mushroom Kingdom. Cheat code: add hot water. When you need to get a jump on your day, do it with the guy who jumps throughout his entire day. This officially licensed ceramic mug captures the joy and fun of the Mario universe in attractive drinkware. When triggered with heat, the wraparound artwork depicts the roving Goombas and rabid piranha plants ubiquitous in the beloved video game franchise. No matter the temperature, the handle and interior glaze remain red… fitting for a guy who hasn’t changed his clothes in nearly 40 years. When coffee is your powerup. 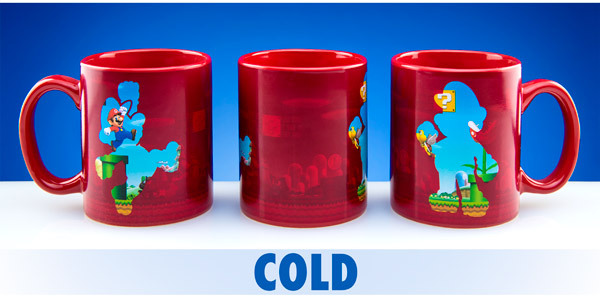 Question: How is this different from your other Super Mario Heat Change Mug? Answer: The mugs, like the Mario games themselves, have the same basic characters and setting with different aesthetics. The Modern mug has smooth, 3D artwork and a detailed background while the Classic mug is inspired by older 8-bit graphics and level design. Question: Can I see the picture change by putting the mug in the microwave? Answer: The Super Mario Heat Change Mug should not be microwaved since it could damage the glaze. It should not be cleaned in the dishwasher for the same reason.